Musilianji, second in line, as Elima dances through town. A short obituary for Patrick Putnam appeared in the Explorers Journal in 1954, a year after his death. (winter/spring edition, Explorer’s Club, NY). James Chapin, the author, had introduced Patrick to the all-male and smoky New York Explorer’s clubroom in 1929. Who then could have foreseen the path of that wired, young Patrick? Later, on occasional trips back from Congo, Patrick masked growing frustration with bravado. 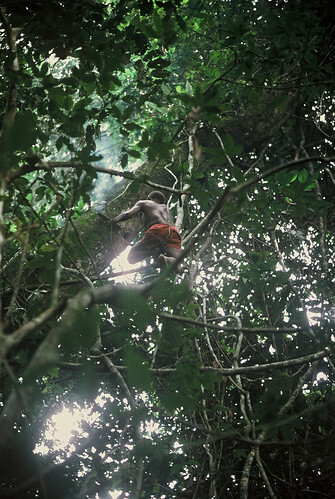 At the Club, even more than at academic gatherings, Patrick thought he should find collaborators, first authors for the many books that could be written about Congo’s forests, books for which he, himself, had almost all the necessary information. Chapin, older than Putnam, was among the most careful and thorough of the early naturalist/scientists of the Belgian Congo. Collector of birds, natural history enthusiast, he, with Herbert Lang, had come to the Congo in 1909 on a collecting mission for the American Museum of Natural History. Meant to be a three-year trip, it lasted almost six. But what made the trip a scientific giant were the many years afterwards that Chapin consecrated to the proper documentation and publication of the raw discoveries. When he met and encouraged Putnam he was already more than 10 years into the scholarly, New York-based phase of his Congo work. Chapin and Lang came to unknown forest. Until then the forest had only been skirted by scientists. From 1868 to 1870, Dr. Georg Schweinfurth collected plants along the forest edge, north of the Ituri. The southeastern border of the Ituri was known from the military post at Beni where, at the turn of the century, Sir Harry Johnston acquired bits of okapi hide, “strange forest giraffe”. Emin Pasha, an impassioned British administrator from the southern Equatoria province of Sudan, fled south in the 1880s to the northeastern boundary of the Ituri bringing his collecting ardor with him. From that forest/savanna post a reluctant Pasha was “saved” by Henry Morton Stanley, who told the world the Pasha was “desperate and besieged”. Emin Pasha returned, however, continuing to collect birds and mammals until Arabs murdered him in 1892 during the Belgo-Arab war. Coming in from the west, Chapin and Lang immediately committed secrets of the forest to collectors’ jars, drying racks and plant presses. All secrets were not considered equal by the Museum, however. Crucial to their mission was the acquisition of okapi skins that could be mounted and displayed. After 25 days of march east from Stanleyville (now Kisangani), Chapin and Lang set up at Avakubi; they never settled as far east as the central Ituri. Later, Patrick Putnam considered it his mission to “open” this eastern forest frontier to scientists and collectors who would use his hotel as a base. This 1932 map was drawn before Putnam’s Palais was built, but after Chapin’s 6 years at Avakubi and Christy’s few months at Mawambi. Patrick Putnam was most inspired by the image of James Chapin’s scientific gatherings in the heart of the forest. More than fifteen years before Putnam was inducted into the Explorers Club, Chapin’s base camp at Avakubi, was the meeting point of the forest’s first explorer naturalists. Between 1909 and 1915, 125 km west of the site Putnam founded on the Epulu River, Chapin was host to the botanist and entomologist, Bequaert, and to the zoologist, Cuthbert Christy. There, at Avakubi, they had shared their discoveries and hardships, and the forest had been all around them, still so unknown. 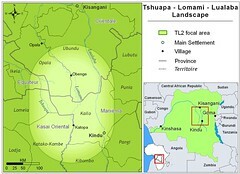 Putnam’s hotel would pull the exploration further east to the very center of the Ituri Forest. The territory was still unknown scientifically and its plants and animals uncollected. This vision became a certainty, in 1932, as he stood on the bank of the Epulu River with a toothache, one failed career behind him and infinite possibilities ahead. If we had come to Epulu forty or forty-five years earlier, John and I could have been Putnam’s team of scientific exploration. As it was, we were our own isolated team and often each of us worked alone. Some of our forest work we could do entirely alone. I particularly appreciated this as my pregnancy advanced. For the most part I did not let my increasing size alter daily plans, but as the months went by, I loved the occasional dreamy slowness that only solitude would permit. I went alone to check my seedling plots and change the corner posts. Stripped of their bark, they were stark white in the deep green shade. I worked slowly, savoring the few hours alone. John also often worked alone though certainly less dreamily. He bicycled the five km west of Epulu to check a series of trees under which he recorded seed dispersal by small duiker antelope. What we learned from one set of experiments made us want to try new experiments. If, as John discovered, most seeds were killed at the mother tree, what became of the few that were dispersed? Were they safe? Our questions kept us focused on the forest. Basapi seeds are duiker-dispersed. We knew this because we found whole fruits in duiker rumens and we found duiker “spit up” piles of three to twenty perfectly clean seeds, regurgitated on the forest floor. It seemed so efficient. Duikers would come under the fruiting tree, swallow the fruit whole as quickly as possible, knowing that leopards too might frequent the tree as part of their patrol. Then, only later when ruminating in some safe quiet place, the duikers would separate off the hard flesh and spit out the seeds. Certain fruits seemed specific to duiker dispersers: tapered for easy swallowing, acrid to taste, and remaining ripe but hard without decomposing on the forest floor. But John’s observations at the mother trees revealed waste and inefficiency. Squirrel predators foraged with busyness bordering compulsion. Squirrels cared nothing for the fruit, gnawing through to the seed directly, devouring it, and thus short-circuiting the seemingly perfect cycle of dispersal and regeneration. John’s trees were rare, scattered here and there in the forest; whereas, I was following regeneration of the most common dominant trees, the ones that gave each area of old forest its character, eko forest or mbau forest. During fruiting seasons, that came irregularly, skipping sometimes several years at a time, these trees dropped seeds in mass to the forest floor. Standing in a fruit-laden mbau forest during the sunny hours of early afternoon was like standing under a vast, fitfully sleeping creature. A loud crack reverberates through sun-touched shadows, like an elbow cracking at full stretch of a yawn. I stand only as high as the ankles. Another crack and another, from far above. And following each snap of an armored pod, the heavy seeds come clattering through leaves, branches, lianas to the forest floor. Just a single mbau seed fills the palm of my hand, a seamless golden brown disc, smooth and faultless. The seeds of these mast-fruiting trees were unprotected, no hard coat, no spines, but within days seedlings would burst from the shiny paper-like covering. It seemed their only chance for survival was speed. Push out the root and shoot as fast as possible. Equally quick were the rodents, the duikers, the buffalo and the elephant. All honed in on the sudden seed feast. We followed the tracks of the elephant and buffalo, coming from miles away. Leaving the moist streamside forest or open wallow they would converge in a stand of mast fruiting eko or mbau. Even we ate the mbau seeds as a tasty bugali made from its ground flour or just as starchy wafers that had been soaked and then toasted in a dry pan. We, along with the whole spectrum of other seed-eating mammals, would, however, have left quantities of surplus seed on the forest floor. Not so the beetle. Somehow in tune with a year of mass seeding, an overwhelming quantity of beetles crawled over the seed crop, laying eggs on seed after seed. Each species of seed had its own species of beetle. There was a curculionid (snout-nosed beetle) that devoured only mbau seeds and a bruchid specialist on eko and another bruchid on tembu. The larvae quickly tunneled into the seeds, pupated, and a new prodigious generation of beetle clambered forth to procreate. Somehow, somewhere these beetles had been waiting, and on cue became simultaneously active and “single-minded”. Generations multiplied from a single seed crop until what seemed amazing was that there should be any tree seedlings at all that managed to emerge from the carnage of the forest floor. Equally amazing was the apparent disappearance of the beetles at the end of the season. Somewhere, in some form they were waiting for another cue that the forest floor was again ripe for a tidal sweep of procreation, incubation and race through the instars of life. By our second year in the Ituri there was always a backlog of partially finished work. On rainy days, John regularly inundated the house with the odors of formaldehyde as he spread out rumen contents from the last hunts we had accompanied. He sorted the whole or nearly whole fruits into piles of known and unknown, the unknown fruit making by far the largest pile. John had only to unwrap his redolent collections and I would wrap up mine, lips clamped tight and eyes watering. As quickly as possible I retreated to our little guest house with my collections of plants and the ancient, only partially-completed Flore du Congo Belge, ten thick volumes of tiny type on onion skin paper that described one after another the known plant species of the Belgian Congo. The Belgian botanists had boldly planned to complete the enormous task of identifying and describing all the plants of their vast colony. During the first half of the 20th century many young Belgian scientists dedicated their careers to discovering and cataloging a single plant family or several families of tree, liana, succulent or herb from the dry savannas or the dense forest or the alpine ridges. Many of the new plant names commemorated these young botanists who, by Zairean independence, had grown old. With their retirement a whole profession was retired. The new university botany was cellular; its discoveries were in the lab. Research had nothing to do with slogging through swamp and forest. Two years earlier, as we prepared our trip I had written a long enthusiastic letter to one of the great fathers of the Belgian botanical effort, Monsieur le Professeur J. Lebrun. I had received a quick concise reply that informed me in one sentence: Nous regrettons to inform you that le Professeur is deceased. Later I was given the ten volumes of the Flora free and even some of the more recent thinner fascicules treating minor plant families that a very few older Belgian botanists continued to produce as they passed the normal age of retirement. Major plant families remained untreated: the Rubiaceae, or coffee family, abundant and diverse in the forest understory and the Eurphorbiaceae abundant at all levels of the forest. If my dried plants were from these families, there was nothing to guide their identification in the 10 volumes. I sat on a short, three-legged stool in the guest-house, where, all around me, on the floor were scores of carefully dried plant collections. The collections had been brought weeks or months earlier by the many Mbuti climbers who knew that for a good flowering branch they could get the value of 25 to 50 cents. I knew that I would never identify most of the plants, at least not in Congo. Still I made progress. 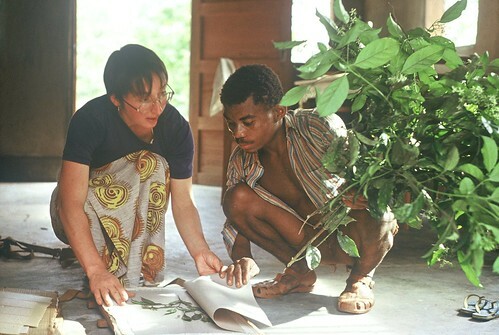 It was John who had insisted that I not only collect specimens for identification by European or American herbaria, but that I also start a herbarium in Epulu. He had the carpenter make a special mahogany cabinet for its storage. Although we were too busy at the time to fully appreciate it, the older villagers and Mbuti alike saw our activities as a resurrection of the constant activity they had experienced at old Camp Putnam. We traveled the forest with the Mbuti, we collected plants and animals and were forever curious to learn the traditional knowledge of the forest. We were more like Putnam than Turnbull had ever been; Turnbull wrote rather than collected. Putnam, however, was a collector. Anne Eisner mentions the collections in formaldehyde that lined the walls of Putnam’s “office”: frogs, lizards, rodents and various outlandish insects. Putnam also kept a living menagerie that included snakes, a chimp, and even an okapi. John’s collection of captive duikers was merely carrying on the tradition. The village children who brought down viazi leaves to feed the duiker every morning took home reports of the growing collection; eventually four species were within the woven stick and liana pens. Along with several blue duikers, there was a bay, two white-bellied and a black fronted. The school children could not have known that unlike Putnam’s captive animals, these duikers provided reams of regularly recorded information. John weighed their daily food as well as their droppings that were carefully picked from the swept pens under the mbau trees. Unlike Putnam we were already preparing for what we had to do once we left Epulu. We knew that our notes, numbers, formaldehyde samples and dry plants would all return with us to the university. We knew that if we were to get our degrees we would have months ahead of us behind desks facing Michigan winters through laboratory windows. We were still enrolled as students and committed to university dissertations. Putnam had collections and knew the Mbuti who worked for him could help get many more, but he considered himself a facilitator, a source of knowledge. He hoped for, and waited in vain for, scientific collaborators whose work he could inform while still retaining his home and hotel in the Ituri. The three of us at Palais when I am at least 6 months pregnant. In his memoirs, recorded for the American Museum of Natural History, Chapin reveals how deeply impressed he had been with the Congo. He recorded the songs of his porters, which decades later he still sang aloud unabashedly in the back rooms of the Museum. He had recorded the names of all the chiefs, phrases from various forest languages, and folklore of the Mangbetu (tribe on the northern border of the Ituri forest). He had come east towards the Ituri, like his contemporary scientists, Bequaert and Christy, while it was still roadless. He had even once made a side trip along foot trails to the banks of the Epulu. Likely he had come out of the forest onto the banks of the Epulu approximately where Putnam, two decades later, first decided to build his hotel among the mbau. Did Chapin find a village there, the accursed village Putnam learned about later? If so, he doesn’t mention it. Chapin hurried back to Avakubi almost immediately after arriving at the Epulu, because a messenger brought word that a great war (World War I) was beginning. He and Herbert Lang had to leave. Joseph Bequaert, in 1914, had traveled further east, collecting plants along the foot trail that followed the Ituri upstream. 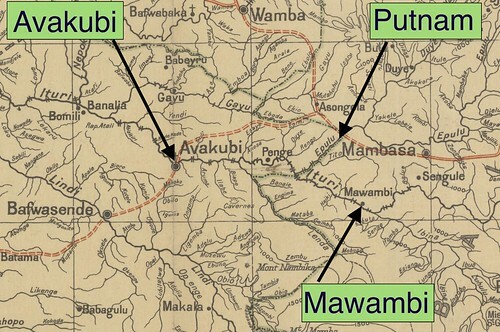 Cuthbert Christy was the only one of the Avakubi scientists, however, that spent any time in the central Ituri, settling for four months in 1912 at Mawambi, south and east of the site that eventually became Camp Putnam. In the smoky halls of the Explorer’s Club in New York, Chapin and Putnam talked passionately, comparing notes and interpretations. Other club members, one by one, left the long table leaving them engrossed. Mostly, Chapin recounted the detailed adventures of a naturalist: how he had discovered the call of the lyre-tailed honeyguide, how he had watched at the nest of a Black-casqued Wattled hornbill where the female was voluntarily imprisoned with her eggs, how he sat quietly at the base of a tree while a mixed troop of monkeys moved from tree canopy to tree canopy overhead. Chapin’s description accurately recalled the minutia. While the monkeys foraged, the long-tailed, white-crested hornbill was in attendance snapping up the scattering katydids. Beneath the busy canopy feast, blue duikers and Peter’s duiker scrounged in the under-story claiming the unripe fruit and leathery fruit-coats rejected by the primates. Putnam excitedly recounted tales for Chapin with the same accuracy and detail. Warmed by a whisky and an attentive audience, he spoke of his explorations throughout the Ituri. The following day Chapin returned to the laboratories of the museum, it took Putnam most of a month to return to the distant forest. Chapin spent New York winters under the incandescent bulbs of the museum’s laboratories. He helped produce the multiple volumes recording his own findings and those of Lang and Bequaert. He wrote the four volume, superbly detailed, Birds of the Belgium Congo (Part 1-4, Bulletin of The American Museum of Natural History, 1932, 1939, 1953, 1954) and several shorter popular articles. 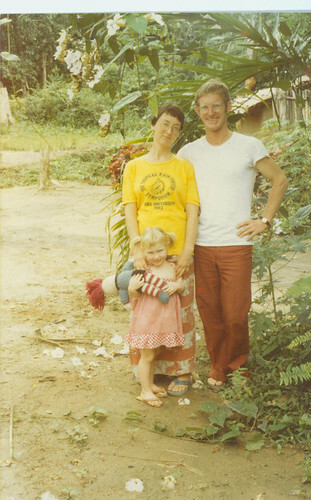 James Chapin never made the Congolese forest his home. He took no Mangbetu wives and assumed no traditional functions. He refers to himself, during his long first Congo trip, as “Little Jimmy”. The only local person he mentions frequently and with particular fondness was a lad, Nekuma, a Mangbetu naturalist from the northern forest border with a superb vocabulary of local bird names and a mental encyclopedia for bird calls. 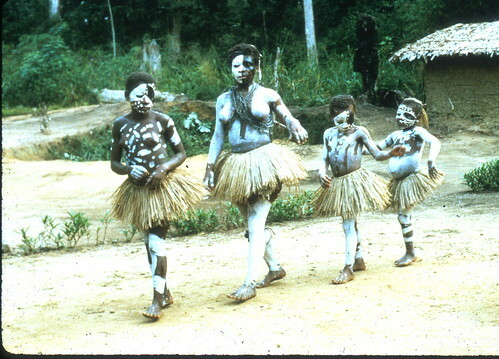 Together, they made collecting forays into the forest, including the trip east to the banks of the Epulu. Although deeply committed to scientific exploration of the Congo, and although he made several later collecting trips, Chapin, like Bequaert, eventually married in the United States, and settled in New York. The American Museum of Natural History rather than the Congo was his base camp. When John was sorting fruits at Palais, Sarah avoided the formaldehyde fumes as completely as I did. Why poison fruits? Edible specimens were just outside the door. An abuma liana (Landolphia) fruited on the edge of our parcelle by the guest house during the 1982 season of abundance. Kole would shimmy up and throw ripe fruits down to Sarah and Musilianji. Musilianji showed Sarah how to open them with a knife made from a flattened nail. Then she showed how to pop out the sweet reddish pulp with one of her fingers. Sarah, imitating Musilianji, would swallow seeds and all, again and again. It was while identifying our herbarium collections that I became aware of Putnam’s work with plants. I wanted to know whether, ambaka, the abundant understory treelet, rarely bigger in girth than my forearm, was Scaphopetalum dewevrei or Schaphopetalum thonneri. I read the lengthy descriptions in one of the ten old volumes of the Belgian Congo’s Flora. I measured leaf veins and counted miniscule hairs with a magnifying lens. Then I noticed, at the end of a laborious description on the yellowed, onion skin paper, a list of plants consulted, where they had been collected and by whom. “Putnam 458” was noted within the list following S. dewevrei ; it had been collected at Camp Putnam. Further ahead in the same volume, there was reference to a “Putnam 125”, a collection of liko the plant whose Cola nut Mbuti chew and a “Putnam 95”, a collection of mbulebe, whose stem is used to make the honey whistle that sounds throughout the most ecstatic of Mbuti dances. Putnam’s collection did not reach high numbers, not like those of Joseph Bequaert whose single collecting trip down the Ituri River in 1904 had numbers in the 3000s, but his collection was a testimony to his concept of Camp Putnam as a research center not just tourist hotel. 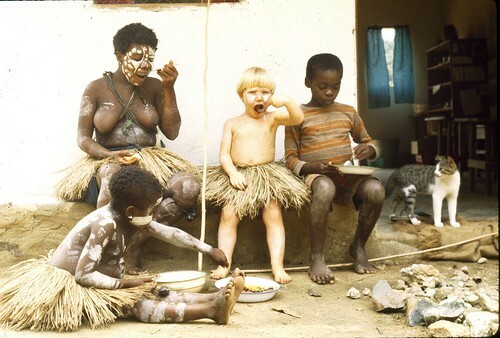 Our second year in Epulu, 1982, was a good honey year. The intense activity of honey season seemed to fit with our determined push to complete a number of field experiments. In June, already, we might pause anywhere in the forest for fifteen minutes and certainly we would hear a swarm overhead. Eko is a bee tree. It had a massive flowering. A month later a soggy brown mat of fallen flowers surrounded the trunk of each tree with a scattering of fresh white blossoms on top. In areas where the density of eko trees was high, the mat spread like a uniform rug. Up the path in Kenge’s camp, as in other camps, as honey season approached, nearly all the fireside conversation was of honey. Men with their wives, or a group of youths, or older men alone, all were looking for hives and marking them. The eko flowering had failed in 1981, as well as the flowering of ngango, checheche, and other bee trees. But in 1982, daily, Mbuti carried gallons of honey from the forest. The smell of eko flowers was identical to the taste of the honey made from them. In the honey camps Mbuti lived primarily on honey, bee larvae and pollen. Honey, more than anything else, united the Mbuti with their forest. By the second half of the 20th century, Mbuti hunting methods varied from one part of the Ituri to another: nets in some places and bows and arrows in others. And the Mbutis’ relationship with the local farmers was equally different from one Bantu tribe to the next: provider of forest foods or laborer in garden, family member or community gypsy. But the pull of honey, its power to over-rule all other considerations, was everywhere. Walking in the forest in November, you rarely see even a single bee. They are all in their hives. If you climb to a hive and put your ear to the hole you will hear a low buzz inside. But then in February, all the time until June, honeybees are everywhere. Their buzzing fills the air from dawn until dusk. They become a nuisance in camp, swarming on food, on bags of salt and on sweaty clothes. In March we began to find the first young larvae and the combs of their dry compact food, ngbondu, the honeybees’ plantains. By April there are combs of adult bees ready to emerge as well as honey, itself. In June and July all the larvae will have metamorphosed and the combs, which once contained baliana (larvae) and ngbondu will drip with honey (ibo ya boki). Honey season in the central Ituri as in the southern Ituri is a time for song. At night, back at Kenge’s camp and full of honey, the Mbuti sing songs and dance dances reserved only for honey season. We hear the chorus down at Palais and wander up the path toward Kenge’s camp even as some of the villagers from town wander down toward the camp. All of us sit on the edge of the circle of song. Throughout the forest, although Mbuti lifestyles vary, the honey music is the same. In the year 1982 and at Kenge’s camp it was Tshukiza and Atoka often joined by Sefu or Kombe that blew the mbulebe whistles. The notes are shrill and sudden from behind the endu or just off in the trees. The chorus of men and women responds with an enthusiastic increase in tempo and volume. The young men, high on honey and high on the buzzing bee-like chant of the women, leap into the fire, dancing over the embers. The women fan the embers into flame. The men dance, their steps a blur of movement. The women sing. Even just watching is hypnotic. Sarah clasps my legs. I gather her close. We feel the clutch in the pit of our stomachs as though swinging high over the shower of sparks and pulsing flames. The food of honey season too is special. Skinny Mbuti children round out, the chests of young men become boldly muscular, a mother’s milk is abundant and yet the mother’s thighs grow round and her eyes bright. Though I grew to love honey and to crave a dripping comb from early in the day, I never developed the full palate. John loved the “juice” squeezed from larval combs, simmered until it curdled like scrambled eggs then mixed with honey and eaten hot. Sarah would spend the day with Musilianji up at the Mbuti camp. She came home with no hunger and full of honey. One morning as John and I were still organizing for the day’s forest work she went marching down the path from camp to the forest. There was Abeli and Gasito in front, followed by Aasha, Safenia, Kole, Sarah and Musilianji. Abeli and Gasito carried honey axes, Aasha and Safenia carried the burning ends of fire logs with empty mwembos (baskets) on their backs. Even Sarah, close behind Musilianji, carried a miniature mwembo on her back. “We are not going far”, Safenia called. Sarah grabbed the sides of her little tumpline, turned and smiled broadly at us, but never missed a step. Writing about Camp Putnam, after a brief and engaging visit, Tay and Lowell Thomas Jr. mentioned: “Scientists sometimes used Camp Putnam as a base from which to study the natural history of the region….” (p112 in Our Flight to Adventure, 1956, Doubleday & Co., Garden City, New York), but we found no account of work occurring there other than Putnam’s own, largely undocumented, collecting. Were the Thomas’s writing verbatim Putnam’s own explanation, and what were really unfulfilled aspirations for his Camp? If Camp Putnam never became a gathering point for scientists, it may be because, by the time the hotel was established in the late 1930s and early ‘40s, the Belgians had already built scientific stations elsewhere. These had easier access than Camp Putnam. They had more luxurious accommodations and were built with libraries and herbarium facilities. There was Yangambi, 500 km west of Camp Putnam in the forests downstream from Kisangani along the Congo River. To the south, again approximately 500 km away, was the station at Lwiro on the borders of highland forests west of Bukavu. Later called IRSAC (Institut pour la Recherce Scientifique en Afrique Centrale), this is the Station that John and I visited together in 1974 when I was at Peace Corps training. Almost all biological studies carried out in the Congo between 1940 and 1970 were based at an official Belgian station. The result was points of intensively collected and well-documented natural history separated by broad unexplored expanses of forest. Putnam was a key encouragement for the anthropologist, Colin Turnbull, and might have been a key encouragement to any young naturalist as well. But a young scientist with a cataloguing spirit and sense of adventure to match Putnam’s, never stopped at Camp Putnam. Putnam maintained his collections, but many were never recorded, never known. They never left the central Ituri, where they were buried piecemeal with the broken china and empty medicine vials. Probably some enterprising villagers recovered the larger specimen jars to store palm oil or drinking water. Chapin was over 60 years old when he wrote Putnam’s obituary. He had stopped at Camp Putnam in 1953, one of several brief, collecting trips after his first major expedition with Herbert Lang. He found Putnam already confined to his bed. He died just months later at the age of 49. Chapin wrote of Putnam’s “beloved forest” and how camp Putnam maintained a “truly African atmosphere”. With understanding he acknowledged that: “Pat’s ideas were different from those of most men; he was usually thought impractical and not easy… But his conception …was original and readily appreciated by anyone with a love of natural history” (pp30-32 Explorers Journal, winter/spring, 1954, Explorer’s Club, NY). How would Chapin have viewed our resurrection of Camp Putnam? He would have recognized the concentration on natural history — Mbuti coming in with flowering branches, the formeldahyde treated and bottled fruits, the books of notes. Chapin was dead before we were in the Ituri at Camp Putnam and it was another 10 years later that we built the research and training center across the River from the Epulu Station. For a few years, until this war that began in 1996, European and American scientists worked side by side. Before that – when it was just John and I, when Sarah was three and I was pregnant – I am certain that Chapin would have felt quite comfortable at our modest reconstruction of Palais. What a treat it would have been to ask him about the forest to the northwest of Epulu, the Congo of three quarters of a century earlier. The natural history continues unchanged long after the colonial aspirations have crumbled. Chapin would have fit right into our Palais. John and I took off in different directions each morning only returning to copy notes and treat specimens in the later afternoon. Tired at night, we were in bed soon after Sarah. It was on Sunday, when workers had a day off that we could catch up on each other’s projects. 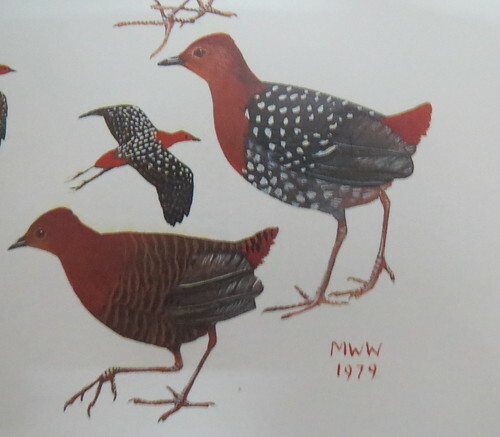 White-spotted crake or flufftail, drawing by Martin Woodcock. Sarah would have come on more Sunday walks, but from the very start of Musilianji’s elima, the elima became central to her life. Elima is a girls’ celebration, an Mbuti coming-of-age ceremony. Although both village boys and Mbuti boys take part in nkumbi, male circumcision, which also marks the transition from boyhood to manhood, only the Mbuti celebrate elima. During Musilianji’s elima most initiates had reached puberty, but there were several younger girls, perhaps nine or ten years old. Sarah, at three, was by far the youngest but was whisked into the activities on easily improvised terms. Like the others, she wore a bouncy skirt made from row upon row of peeled stems of Marantaceae and she had her debarked ambaka stick for lashing any boy that got too close. Kole and the others kept an attentive but safe distance. Elima girls and Kole having a snack at Palais. Unlike the other initiates, Sarah did not sleep in the elima house. She came home at night and bathed off the white clay markings and black kange paint (charcoal set with Rothmannia fruit). I doubt if she took in much of the elima learning either, most of which took place in the evenings along with the singing of specific songs, but she enthusiastically took part in the day time dancing, sometimes traveling up to town or across the river with the other elima girls, and she enjoyed the playful lashing at boys, at least until John got too close one day and the elima girls took off after him. Then she burst into tears. Safenia quickly put an arm around her and castigated the girls, a mock reprimand, as they laughingly tripped back to the elima house. Sarah’s evening baths in the basin became longer, requiring several replacement waters as the first turned to milky sludge from the body paints. We had one very large metal basin that I took outside in full view of the Epulu River; I sat on a low stool nearby with the top reprints from my “to read” pile, articles from Ecology or Journal of Ecology or Oikos. The articles were more than a year old, but they were our connection to a distant university world. For the most part I let Sarah take care of the washing herself. As the bath cooled, I added hot water from a bucket left by the fire. She talked to herself, dressing herself in sudsy finery. The evening mellowed; I read less. A flock of gray parrots called as they flew overhead. Frequently two great blue turacos conversed raucously as they flapped from one tree to another, choosing a roost at the edge of our clearing. Laughing hornbills, in a flock of ten or even more, came almost every night in a high lilting flight over the river. Their far-reaching call welcomed evening as authoritatively as a Muslim imam from temple minaret. Up the hill in Epulu there was an official muslim Mungwana crier. For lack of minaret he stood on a chair and held up a sort of home-made megaphone but we were too far away to hear him at Palais. After the hornbills the daylight sounds subsided. The blue monkeys sat silently in the mbau trees, so silently that I would only see them accidentally as the sun sliding past turned the trunks to vivid gold. There were many fewer mbau at Palais now than when Putnam first built. Some had succumbed to fire when the brush was being burned for a kitchen garden, several more, standing alone and susceptible had crashed down in the fury of a late wet season storm. Sarah piled sudsy hair high, the setting sun turned the suds a brilliant pink. In contrast, on either side of her bath, an eko and a lone mbau cast a sharp black shadow. With fistfuls of suds Sarah fashioned ample breasts then, from the silence, she asked, “I came from your tumbu (belly) too, didn’t I?” My belly was round and Sarah could feel the kickings when she put her arms around me. “That’s where you came from”, I answered absently. Sarah thought for a minute. Then she told me, “Before I was in your tumbu, I was in the forest”. The shadows deepened towards dusk, I added a bit more hot water to the bath and then sank back into the sort of torpor that I allowed myself more and more frequently. John was tending the captive duiker he would not be ready to eat for another half hour. Sarah said, that she came from the forest, why not? Perhaps that is part of the eilima wisdom Sarah did pick up — the forest is life-giving—or perhaps it is just part of the common knowledge that she is bound to assimilate while playing in Kenge’s camp. Any person who spends time beyond the gardens will feel that the forest is full of life. The village, by contrast, controls life. The bare ground of court-yards, the enclosed chicken roosts, the tiny windows of houses all are attempts to control the mongoose, snake and sorcery. Turnbull saw this and jumped to describe villagers as anti-forest. Putnam, perhaps knowing more about the forest, was not anti-village. But he reveled in the awareness of ubiquitous forest life: insects from branch tips to deep in the ground, birds and mammals, day and night, calling, flying, hunting, birthing. Although collectors hope to preserve all forms of forest life for museums, herbaria and books, the idea, itself, of the forest as life does not make much sense outside the forest. The forest, like the savanna or mountain, is reduced to a geographic reality: the textured gray of old aerial photographs. But under the leaves of the canopy, there is a breathing, singing, multiplying reality – a sum of all life. Christy settled for four months in 1912 at Mawambi, across the Epulu River and about 30 km southeast of where Camp Putnam was eventually established. Mawambi was abandoned soon thereafter, when the road was traced further north replacing the foot and river route through the forest. Net-hunting may only have been adopted by the Mbuti during the colonial era. 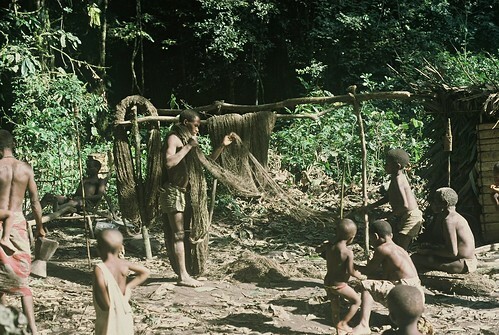 We eventually learned that the Mbuti only adopted the villagers’ net method of hunting after the Belgian reorganization of the villages in the 1930s (Michael Rösler personal communication and ”Shifting cultivation in the Ituri Forest, Haut-Zaïre: colonial intervention, present situation, economic and ecological prospects” pp 44-61 in Les Peuples des Forêts Tropicales, 1997 eds. D.Joiris and D.Laveleye, U. Libre de Bruxelles, E. Guyot, Brussels.) The Belgians formed agricultural cooperatives that had the villagers working under a demanding quota system, but left the Mbuti without obligations. Not only did Mbuti start using the villagers’ nets at this time, but they also developed the exchange relationship that still exists with the villagers. In short, it was colonial regulations from the 1930s that defined the situation that Turnbull considered “traditional” in the 1950s. Cuthbert Christy was in the Ituri before World War I but we found no local memory of his visit just as for Turnbull there was little memory beyond the personal reminisces of Kenge. But Putnam, between the two, had entered the oral history of the region. Potolito Putinam (Patrick Putnam) was the model we were expected to follow and often our life was simplified by deferring to Putnam’s remaining circle of trusted acquaintances. It was near the end of Musilianji’s elima that old Kalume died. Kalume, a Bila villager living up the Palais Path, was a keeper of local history. His family had worked many years for Putnam and after Putnam continued to guard the site of Palais. Frequently we would find Kenge, Fasili, Makubasi and other older Mbuti around his fire. Nor would they be drinking, as was generally the case when we saw a gathering of Mbuti in the village, they were talking in subdued voices, remembering. One day, after not seeing him for several weeks, I saw Kalume by his fire as I passed on my way down from town. Even from a distance, I could see that he was gaunt, all hollows. I called out greetings but his slow response, a slow raising of his hand, seemed ominous. Kalume was obviously not well. I crossed the baked earth and ducked under his barazza thatch to hear if he had something to say. Kalume’s cheekbones and knees were startlingly prominent on his long thin frame. His eyes were sunken and the voice weak. “Your time is coming. God bless you.” He said slowly raising his hand towards my belly, “I will be leaving, Mama Sala, before your baby comes. You see I am just bones”. We did not have much to do with Kalume. He managed his garden with his wife and his sister and generally kept to himself; but just a few months earlier he had intervened in a critical way. There had been thievery at Palais. It was not much money and happened late in the afternoon, when people had gone home. John and I were down at the river washing up, Sarah was still with Musilianji up the path at Kenge’s camp. When we came up from the river, John, with his towel still over his shoulder, started to put away some money he had just counted. The equivalent of about one dollar was missing. We realized that it might not have been the only time money was taken during our bath. Often we left money out, although usually we had not just counted it. The next day we hid the money and then locked our office before swimming. We came up to find that the key had been moved. After that we took the key with us. It was not that a lot of money had been taken, but obviously someone very familiar with the house and parcelle had taken it. I suppressed a feeling of betrayal. The someone who came must have known when we swam and right where to look for the key. We might have been able to successfully ignore the theft except that soon a Peace Corps volunteer spent a couple nights in our guest house. He was traveling across the Ituri by catching rides in trucks, about the only way possible without your own vehicle. He’d been rained on and needed a couple nights to recover before continuing. He left three hundred Zaires, about $30, on the table in the guest house and came over to talk to us. When he returned it was gone. We could not ignore this and, thank goodness, there seemed an obvious culprit: a temporary worker, Kpokpou, an Mbuti lad from 20 km down the road. He was doing day labor while I gave him penicillin shots to treat his syphilis. Administration of penicillin was the only nursing role I had been convinced to adopt. Kpokpou had been hanging around the parcelle after his shots and just when the money disappeared. We sent Kachalewa and another worker after him. They found Kpokpou and the money. He refused nothing, but he also implicated Tshukiza and Abeli. Albert, the Peace Corps volunteer, was cheerful and impressed by the quick and successful retrieval, but John and I felt terrible. After Kpokpou was marched off, banned for a whole month from the right bank of the Epulu, I trudged down to the river just to be alone and think. Whereas Kpokpou was a casual day laborer, Abeli and particularly Tshukiza were family. They lived just up the path. I worked with Tshukiza daily. Tshukiza’s knowledge of local plant names was as good as Kenge’s. He had a photographic memory. Often I examined a branch thinking it was the first I had seen a species. Tshukiza would take it, study it for a moment and likely say something like: “We saw that at Kiokiokio” or “near the Eboyo. You remember don’t you? It was the third day we were on the hunt.” And he was always right. He could lead me several hours to where, far off any path, a tree we had seen months ago was now in flower. Tshukiza climbed the highest and most difficult trees when it was obvious I needed a good specimen. It was more than an impersonal recognition of his ability that I felt. It was more than admiration. I felt a sense of partnership and reliance, reliance on his knowledge, his physical strength, his curiosity and his interest in my work. That he might be a thief, stealing from us, was something I could not harmonize with my image of Tshukiza. Pressing flowers brought to Palais by Tshukiza. John and I decided that we had to go through a regular village tribunal. An accusation had been made and we could not let it seem that we did not care or that it was unimportant. The chief of the tribunal was a Mungwana. He held court in a crumbling little mud building with a Mungwana clerk and an Ndaka “policeman”, dressed in ragged pants and a tattered jacket from some official uniform…probably left from the colonial era. Feeling out of place, I sat on the edge of a straight back chair watching what was obviously more performance than trial. John had not come, he was preparing for a trip into the forest later that day. This Mungwana “judge” had no traditional authority. “All these Wangwana are only immigrants, came in with Arab invaders ” I thought contritely, “If I don’t respect them, certainly Abeli and Tshukiza don’t”. The policeman stood, menacingly, legs apart with a long piece of rubber tubing in his hands. Tshukiza was asked if he had stolen. He denied it. Then the policeman clamped his arm behind his back and twisted. I couldn’t take it. This was not my idea of a trial. I told them to quit. They gave Tshukiza two lashes and Abeli two lashes. They were sentenced to a week of hard labor and fined 50 Zaires each, an amount paid into the personal purse of the chief. I told John what had happened. We were dejected but John went, as planned, into the forest following Kenge who was already at a hunting camp on the east side of the river. He left feeling, as I did, that the theft had not been properly handled. There had been no confession, and no apology from either Tshukiza or Abeli and somehow we had set ourselves against the people to whom we felt closest. A couple of days later, in the evening I was sitting outside talking with Basisionoko when Kalume came down. He came by himself. I offered him tea. Perhaps we said something about the weather, or the low level of the river, but very soon Kalume took over the conversation. He had things to say, history that he had been storing up. It was like story-telling but somehow very pertinent. People started coming down from camp as though this was a special and long-awaited occasion. Tshukiza was among the first. Abeli came with his wife, Aasha. Gasito was there with his wife and children. Madeline came and Safenia who had not gone into the forest with Kenge but had stayed behind to care for the elima girls. Atoka and his wife came. They sat on stools or pieces of wood taken from the pile stacked for the kitchen fire. Kalume told us stories of people in the forest, he told us about the capture of the rebel Kasongo in the 1960s, and the end of the rebellion. Parrots flew calling overhead and Sarah was tucked under my arm, still un-bathed and covered with kange paint. Kalume moved slowly back in time. He talked about the history and traditions of Palais, about Putnam, his projects and his wives. He mentioned the places Putnam had visited and sketched the lives of his key workers, now dead. He made us all feel important, part of the continuing epic of the forest and of this particular place. Somehow he placed everything in a new perspective: all of us sitting together at Palais, the thievery that had just occurred, and our collective hopes for tomorrow. Kalume talked a long time and then he just stopped and everyone returned to camp. Kalume came down again the next day when Kenge returned with John from the Biamate camp. We pulled up stools; he explained that a traditional punishment was necessary for the thievery. Kenge, who had not heard about the theft, was furious, humiliated by his “children”. He said he would move the whole camp. He would break it, burn it, trust had been broken. That, of course, would have been a punishment as much to us as to anyone else. Kalume reasoned with him, saying that his running away would set nothing right. What was needed, he said, was a traditional “beating” with ambaka to get the thief out of Tshukiza’s and Abeli’s roho (spirit) before it had a chance to move in. The ritual occurred two days later, on Friday morning, after Uhmudi, Fasili, Ndakala, Makubasi and the other older men had come in from the forest. It was very short. Abeli and Tshukiza got two lashes each while first old Fasili and then Makubasi ranted at them. All the other elders made a half circle to watch. Then it was over, very quickly. The week of hard labor assigned to Tshukiza and Abeli turned out to involve the whole camp. The focus was off of Tshukiza and Abeli. Everyone had jobs. The women were being accused of laziness, but spirits were high. And our spirits, John and mine, were up again too. There had been reconciliation between Tshukiza and Kenge, between Kenge and us, between the Mbuti camp and Palais. That was just a couple of months before Kalume’s illness. Kalume, so skeletal, who saw his own death so clearly, was now beyond choreographing the steps of the living. He was watching his own fast-approaching death. I mumbled something like I hoped that he would see our child. I held his hot, dry hand, for a moment, as though I would shake it, but I didn’t. I left. Before Kalume died there were trials for sorcery. It was claimed that at midnight someone had spilled blood on the bare ground in front of his house. A trail of blood took off across the gardens. “Perhaps its from the leopard that tried to steal the dog from camp last night,” I suggested. No one agreed. “No Madami, it’s bolozi (sorcery)”. They found the sorcerer. They said that there could be no doubt. It was an ill-intentioned neighbor. They found people’s “dirt” and clothes under his bed. What seems amazing is that the neighbor did not deny the accusation. Even a thief with evidence piled against him will deny a thievery, as did Abeli and Tshukiza. So why didn’t the old MuBila deny that he was a sorcerer? After Kalume’s death the village itself moved down to his compound to mourn. He had been highly respected by both villagers and Mbuti alike. In the evening six or seven fires burned around his barazza. Ndaka, Bila and Mbuti all came to sleep, to talk, to remember. They slept on mats, in chairs or even on light weight beds of palm and kombokombo wood that they carried down. We sent up sugar and coffee. The communal mourning lasted five nights. If Kalume had been older, then perhaps there would have been no accusations of sorcery. The few very old people in Epulu, and they were probably only in their late 60s or 70s, died without causing community discord. They just died of old age. They got tired, we were told. But death that took someone from an active life, and left children bereft and the community poorer, that death had to have a cause, some evil intention. This was no different for the Mbuti. If an energetic laughing member of the hunt suddenly sickened and died, he brought death closer to all the near survivors. All Mbuti camps were associated with some village community. If an Mbuti became seriously ill in a hunting camp he would be brought to the village to die. Rather than separate themselves from the village understanding of death, the Mbuti seemed to need it, having no other balm for a sudden loss. In 1974 John wrote of an Mbuti death in the southern Ituri. “In less than two hours after the death, the villagers had dug a grave. The BaMbuti stood around watching as the cultivators sweated and toiled in the mud. Kilolo was buried without ceremony. The BaPere were so pressed that the few rags which shrouded the corpse fell away and the dead man’s head bounced limply in the mud. Then pushing the mourning BaMbuti aside, some of whom were trying to throw themselves into the grave, the villagers hastily shoveled dirt into the open hole. The BaMbuti had very little to say. Some wandered off, others simply sat and listened. Mbolu was ordered before the presiding MuPere. Two village men put her clasped hands between pieces of wood and applied pressure on her knuckles until Mbolu shuddered with pain and stammered out a confession. She listed names of four others from her natal village as accomplices. In Epulu, the Mbuti, themselves made accusations of sorcery when the wife of Kurani died. We said that we would transport the sick woman to her family’s village about 6 km across the river. That evening Tshukiza came to tell us urgently that Kurani’s wife was very ill. I went ahead to see her while John prepared the vehicle. “The tiny house was already crowded. The sick woman was lying on the ground. Three women sat very near her, touching her, holding her. Kurani, agitated and despairing was talking. ‘I’m not hiding anything’, he said, ‘It started just after we were building our endu together. A mulozi broke into the house while we were sleeping.’ I couldn’t understand everything as he changed from Swahili to Kibila and back again. It seems that his wife’s leg was pulled by the mulozi. ‘We’ve been together since before independence’, Kurani told me. Occasionally he spoke his wife’s name, Mayasa. He had to call several times before she’d respond. Her head lay against another woman’s shoulder. Her tiny body, which looked much older than it probably really was, was excruciatingly thin except just below the rib cage, the center of the pain, where it was swollen and seemed to sag as though some weight lay inside. The face was drawn. All was sharply defined by bones. The eyes, however, as they flicked open in response to Kurani’s soft crying, ‘Mayasa’, ‘Mayasa’, appeared huge and luminous. We heard the sound of the Toyota. It drew up outside. Tshukiza, who had accompanied John, dumped Sarah into my lap. She was round strong, and all smiles. She certainly weighed more than Kurani’s wife. Another woman carried Mayasa out clasping the thin body as if it were a child’s with two frightened eyes glowing intensely. I asked Masuli who had “killed” Mayasa. He did not hesitate: Kurani’s relatives. In our letters and journals, John and I had frequent passages about death. When an employee or friend died, who was blamed? How was it finally resolved? James Chapin did not write about deaths, neither amongst the hundreds of porters used to carry the Museum’s supplies and collections, nor amongst the villagers at Avakubi when he was living there. There were no fewer deaths among the young and able at the beginning of the 20th century than later but Chapin’s attention was elsewhere. Perhaps, with the exception of his good friend Nekuma, he maintained a distance, a professional relationship with the human world around him. Not so Patrick Putnam. His dispensary had him in the center of the local drama of life and death. But he left no records, no written reflection on sorcery and how he accommodated it. Ann Eisner Putnam and Colin Turnbull both wrote of death. Their understandings of the Mbuti view of death differed: sorcery or no sorcery; the justice of the forest or the injustice of one’s fellow man? They only agreed that the microbial explanation of disease was irrelevant in the forest. How do you punish germs? How could knowledge of that impersonal causation help reconstruct order among the living? Sorcery can be a useful explanation for death. It is flexible. Sorcery ends the petty feuds that the recently dead left behind. The accused are sometimes those that most loved the deceased, those that are most in need of an explanation and willing to accept any explanation. An accusation of sorcery compounds their suffering, but it makes more concrete what is diffuse and incomprehensible. Almost always, the blame is eventually pushed to some unknown far-off relative. The death of young children was different. Although by far the most frequent to die, young children, at least among the Mbuti are grieved with little community participation. The parents seek no outside explanation. I was very pregnant as I stood in the damp early morning behind camp while a small grave was dug among the esuku and mango for Amanjau’s baby. She was, at last, quiet, her struggles over as they lowered her small cloth-wrapped body. She was not yet a year old, when, just a couple weeks ago she started to wheeze slightly from congestion. It must have been pneumonia. Poor Amanjau. The day before she died he came to me, tears streaming down his face. “Madami, she is suffering so”. He wanted 10z, about one dollar, to pay for some traditional medicine. Amanjau pressed me to come see his daughter. Camp life was going on as normal with yelling and running about. Inside the endu it was just Amanjau’s wife, his mother and the baby. As my eyes adjusted to the dark I saw the baby in its mother’s arms. If the mother glanced up she never saw me, so concentrated was she on her struggling child. It was rasping for air, heaving with its chest and its stomach, its whole body laboring. How can so small a child suffer so much? The death of a baby was a personal tragedy rather than a community tragedy. For weeks after she was buried Amanjau groped to return to normal activities. He would lapse into dejected isolation alongside the jostling fireside crew, “She suffered so, my spirit hurts”. I knew less of Gasito’s child that died or Madeline’s. I knew that the childless women, including Safenia, Sofi and Aasha, had all had children, one or two, that had been lost in the first months or years of their lives. All deaths in the Ituri are not equal because it is the community wound that matters not the physical end of a life. After some deaths the wound is enormous with many people affected, after others it is small. All animal deaths, too, are not equal. As hunters, the Mbuti consider the killing of small duikers routine. Chapin met no resistance to shooting birds for specimens. His close assistant, Nekuma, gathered his knowledge as a child waiting under fruiting trees for birds that he could bring down with a sling shot. Interestingly large mammals are not treated quite so off-handedly. Among the Mangbetu, west of the Ituri Forest, Herbert Lang had trouble collecting a good okapi skin for the Museum because any okapi caught in a snare, according to local custom, could neither be shot nor speared but had to have its skull bludgeoned. Even Sarah who, as a toddler had stuffed bunnies and picture books with cuddly animal heroes, was easily wooed by the pride and obvious benefits of a kill. Hardly a year after we had arrived, one of Sarah’s and Kole’s favorite games was to play “house” local style with a number of other Mbuti children both older and younger. Essential was the dead bird, squirrel or small fish. Some children took off with slingshot or fishing pole. Others dug etaba (a sort of yam) on the edge of the forest, or got a few manioc roots from our kitchen or someone else’s. Sarah, with a friend or two, tended the little fire on the edge of the forest, roasting the roots and waiting for the successful kill. Then the animal was cleaned, wrapped in leaves and roasted. She eventually showed up with a little piece of leaf cupped in her hand. “Salt please”. Basisionoko gave her a little pile. In exchange, she promised him a piece of manioc and meat, then darted off triumphant. Large mammals are treated differently. When caught on the hunt they receive special respect, a recognition of each animal’s significance to the forest. There are dances for elephant hunting and many stories of past hunts for elephant or okapi. It is not their economic value that makes them important; in fact okapi meat is not even traded or sold. These animals cannot be separated from the forest; they are the forest. Though seldom seen their sign is everywhere: broken branches, browse sign, dung piles, entire trails. Like the baketi, the large mammals define the forest. 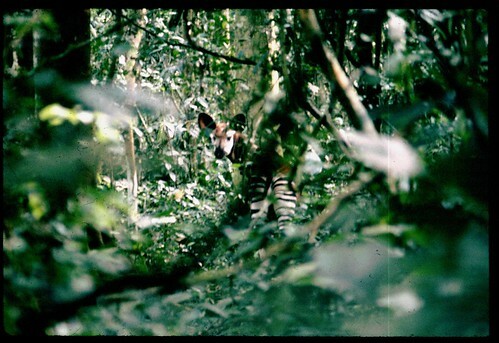 After one hunt Atoka breathlessly told how an okapi had gone right by him, broken through his net and charged on into the forest. He had stood and watched with admiration. “Why didn’t you spear it. Or call the dogs to chase it,” John asked. Atoka cocked his head, considering what had seemed obvious to him “That would have been greedy”. And he indicated his wife, Mayasa, who was very pregnant. Her naked belly, decorated with kange designs, ballooned over her loin cloth. She smiled at us as she adjusted her tump-line and balanced her basket on her back. I found myself wondering how John should be careful, after all I was nearly as pregnant as Mayasa. One morning in a forest camp, with the sun barely on the crests of the trees, the older men rounded up all the young boys who had been circumcised the previous year, and whipped them, one strike each, with long ambaka poles. It was because of the moimbo (yellow backed duiker) killed the day before on the hunt. The moimbo is the largest of the duikers. Full grown it weighs more than a hundred pounds. The explanation for the whipping was: “They breathed in moimbo. It might go to their heads, they’re still soft.” Certainly the sight of the moimbo on the forest floor was breath taking. It was solid black with a ridge of longer yellow fur down its back. The dogs were in and out of the legs of the men, trying to lick blood from the leaves. Bilali’s wife rubbed oil from the antelope’s facial glands onto her own face whooping victoriously. 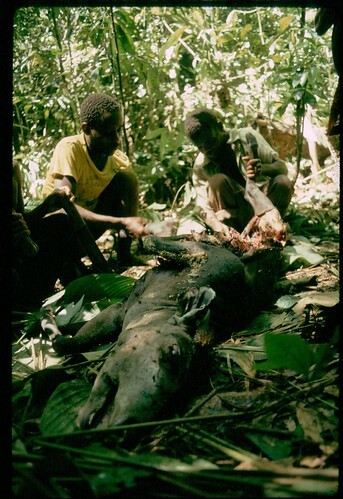 A moimbo being butchered in the forest. The death of an okapi is also a grave portent. Like the yellow-backed duiker, they are killed rarely. If an okapi is killed on a hunt it is almost certain to be a very young okapi, still with a long soft coat and dorsal mane. In the first few months of its life, the okapi “nests” in one place in the forest while its mother forages the surrounding hills. When the net hunt surrounds it, the calf is flushed by the cries of the women. The taking of an adult okapi, however, is exceptional. One morning, during the elima, Kenge left his Palais-path camp with spear and a dog. He came back in the late afternoon going straight to camp. All the elima girls and women left immediately for the forest with empty baskets, there must have been ten of them. Just one of the younger girls, Nyamisi, stayed back with Sarah. It was after dark when they returned. Sarah had already bathed and we had eaten. They walked from the forest with live embers and a torch made from Mbeli resin. It was a moonless night. I tried not to think of the okapi calf, left alone on that new moon night, curled in the darkness of the forest. Why had its mother not returned at dusk? Why was it still hungry? To erase the regret I imagined that the okapi was almost independent. With daylight it would be able to forage, find the young edible leaves and competently strip them from the branches. After all, okapi don’t depend on their mothers for long, only four or five months. They are born after 14 to 15 months of gestation and need only a little nuzzling towards self-reliance. Suddenly camp burst into song. Elima song. It was Sarah’s bedtime; already her head was resting heavily on the ledge of my belly. But tonight was clearly special. Large as she was I swung Sarah into a mazembe and we headed up to camp. The singing in the elima house was magnificent. We ducked in and immediately saw, propped against the wall, the large head of a female okapi. The dark eyes were open, still luminous; the ears seemed cocked and listening. The elima house is large but still just an endu. I could barely stretch out at its widest point and I could not stand without bending my head. The endu was packed with women: old women, young women, women with babies at their breast, or like me, still in their belly. Sarah scrambled over to Musilianji who included her in the tangle of herself and other elima girls. Somehow it seemed appropriate that the head of the okapi should look on. Firelight played over it; the soft eyes, great woman-spirit of the forest. The large ears seemed to listen attentively with recognition as the elima songs enveloped us all. It was my destiny, too, that was being sung. The song simplified problems and replaced thought. Every woman’s thread was woven into one song: birth, separation, continuation and birth again. That night was also a changing point for the elima. It had now gone on for many months. Usually an elima does not last more than six weeks to two months. The camp was as reluctant to let Musilianji go as we were. But that was why she had come from Mambasa. The elima was a preparation for her marriage. Atoka’s wife was now pregnant; her unmarried brother was in Sarate just 20 km further west. We didn’t want Musilianji to go; Sarah didn’t want her to go. The camp didn’t want her to go. But it was in the order of things that she should move on. Somehow the okapi-mother’s presence made it indisputable. Sarah and I stayed until nearly midnight but the singing went on until almost dawn. As light came, the elima house was silent, the women dispersed and the okapi head disappeared. A week later Musilianji was “taken” twenty kilometers to the west to marry into the family of Atoka’s bride. Musilianji, burnished from head to foot with a palm oil sheen and wearing only an intricately decorated bark cloth at her hips, was marched off in the center of a vast procession of relatives and friends. Only her parents stayed behind. It was a sad separation; she was so loved by us and by the whole camp. For several weeks Sarah had recurring dreams that Musilianji returned. But she did not. And Sofi came back to care for Sarah. This entry was written by Terese Hart, posted on 2014-08-19 at 12:03 am, filed under Ituri Story_memoire. Bookmark the permalink. Follow any comments here with the RSS feed for this post. Post a comment or leave a trackback: Trackback URL.